Hundreds marched in Richmond for more state funding for schools yesterday. Here’s why they say they did. 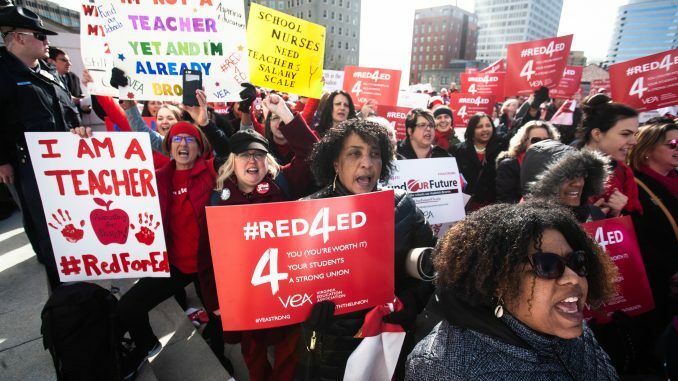 The Virginia House of Delegates announced a 5 percent increase in teacher and support staff salaries Monday as attendees of a march and rally outside the Capitol pushed for increased funding in public schools. 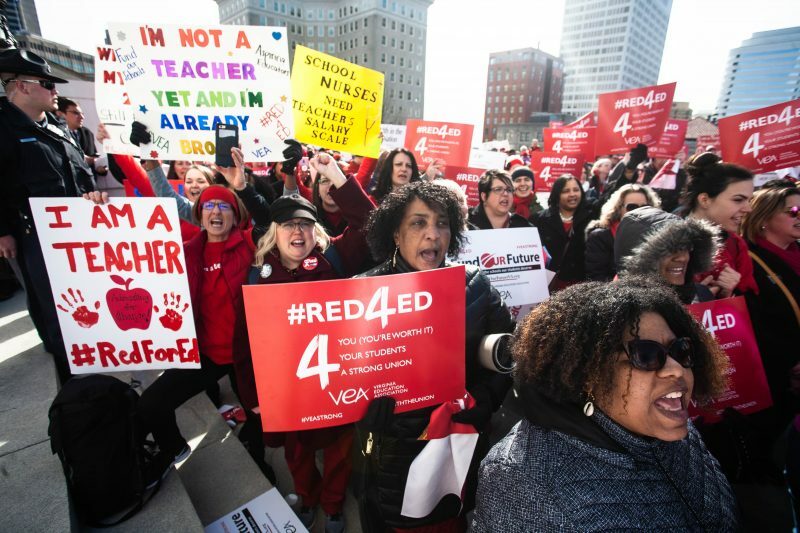 The marchers, who used the hashtag “#Red4Ed” on social media, wore red and chanted as they walked from Monroe Park to Capitol Grounds in the Downtown area. The group comprised of teachers, students, and parents advocating for increased salaries, renovated school buildings and additional staffers. Jim Livingston, president of the Virginia Education Association, decried outdated technology, old textbooks and insufficient funding in a speech he gave to the crowd of hundreds. “It’s time for legislatures to get on board or get out of the way,” Livingston said. “We’ve reached a point where legislatures need to come up with the money or we’ll replace them. Livingston said the state needs to re-evaluate its formula for distributing funds to school districts. The increase in teacher and support staff salaries is in addition to the 3 percent increase which was already included in the state budget. Gov. Ralph Northam proposed the additional 2 percent increase, which passed in the House, but still needs approval from the Senate. Sarah McMillen, a second-grade teacher in Chesterfield County, said teachers in the school system face multiple problems including missing out on lunch breaks because they have to watch children or attend meetings regarding SOL requirements. McMillen said most people do not realize how difficult being a teacher is. “I dare anybody to swap jobs for a day and say I don’t deserve twice what I make,” McMillen said. The state’s public funding formula was revised in 2009 as result of the recession and has not been reversed, despite the fact that Virginia’s economy has recovered since then. Virginia ranks 34th in the country for teacher pay, according to the National Education Association, despite having one of the lowest poverty rates in the country. Education funding in the state has dropped by 9 percent since 2009. Cody Sigmon, an eighth-grade English teacher in Chesterfield County, said Virginia needs a state-wide solution to funding issues. “Across the state you gave gigantic disparities, because you’re only as capable of funding your schools as your tax base,” Sigmon said. “I’m here because I want to support the educators who teach in Virginia because they’re not getting paid very well,” Elinor said. “Our teachers are resilient and they still want to teach even though we’re bad and underfunded,” said Lux Aghmo, a high school student at Richmond Community High School. Tiffany Kopsak, a high school journalism teacher in Stafford County, commented on where the public funding is most needed in the school system. Kopsak said teachers are unable to fully support themselves independently under the current set salary. Michael Snead, a high school journalism teacher in Stafford County, commented on the reason why teachers are quitting their jobs. Cathy Crane, a reading specialist in Fauquier County said that often teachers can’t afford to live in the same areas they teach. Elementary school student Holden Carleton said he appreciates his teachers.